When he was 3 years old, Keaton Weimer had a simple request: he wanted to be a pirate for Halloween. Keaton’s dad, Ryan, doesn’t seem to do anything in moderation. Keaton and two of his siblings were born with spinal muscular atrophy, a condition that will require the use of a wheelchair for the rest of their lives. Ryan didn’t see the wheelchair as a problem when Keaton asked to be a pirate, he used it as a canvas. The resulting pirate costume included a wooden ship with black sails that appeared to be floating as Keaton drove his motorized wheelchair around the neighborhood on Halloween night in La Grande, Ore. An idea was born as Keaton made the rounds because of what Ryan saw happening. The following year, Keaton wanted to be an elephant and Ryan and his wife Lana crafted a paper maché elephant that enshrouded the chair as well. The process continued and included crafting costumes for and another son, Bryce. Keaton and Bryce kept coming up with challenges and Ryan and Lana had to keep figuring out how to meet them. A decade later, in 2015, Magic Wheelchair, an non-profit creating some of the most elaborate costumes imaginable for youth in wheelchairs, came into existence. 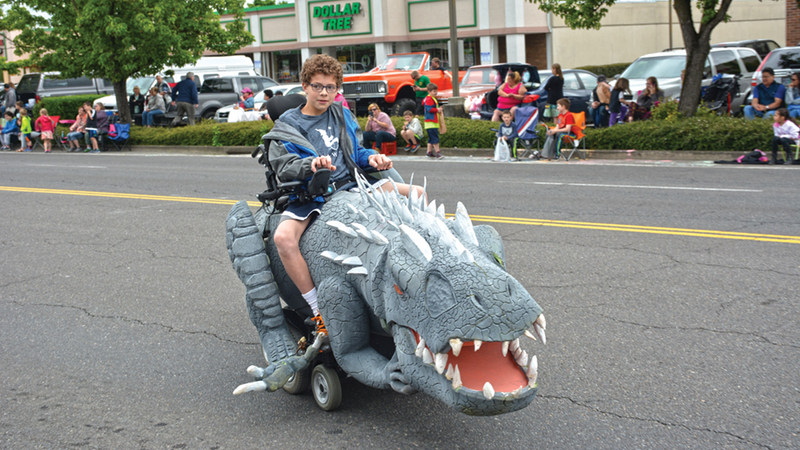 Many of the custom creations have made their way into the Keizer Iris Festival parade, but Magic Wheelchair is now a nationwide phenomenon. The costume that put Ryan and his family and their creations into the bigger spotlight was Toothless, a dragon from the movie How to Train Your Dragon. It was Keaton’s wish for Halloween 2015. The problem was it required Ryan to up his game yet again. He found the solution in the Stan Winston School of Character Arts, which offered online video lessons. Winston is the creator behind some of the most memorable character designs in Hollywood including for the films Terminator, Alien, Predator, Edward Scissorhands and the dinosaurs of the early Jurassic Park films. “I had signed up for their classes to get ideas for the costumes and I saw a foam fabricator, Ted Haines, build a giant T-Rex head. I knew as soon as I saw it that was how I had to build Toothless,” Ryan said. At the same time Ryan was crafting the Toothless plans, he was getting help from a friend at his church, who was studying non-profit law, to launch Magic Wheelchair as its own entity. Toothless was going to be the project used to launch a Kickstarter campaign to establish the organization. There was only one, small problem. Ryan couldn’t figure out how to procure the foam to make Toothless. He sent an email to Winston’s school about what he hoped to do and Winston’s son and son-and-law, Matt and Eric, responded with a personal message. “It included a refund for all the courses I had already paid for and a lifetime membership in the future” as well as an offer to help him get the foam needed for Toothless. The Kickstarter campaign that launched Magic Wheelchair asked for $15,000 and ended up amassing more than $25,000 in donations. As an organization, Magic Wheelchair assembles the teams to make the costumes and takes in applications from both kids and volunteers via its website, www.magicwheelchair.org. The first year, teams of volunteer builders constructed costumes for five kids in Oregon and two in Georgia, which were taken on by a high school class in Gwinnett, Ga. In 2016, Magic Wheelchair assembled 25 costumes. Last year, 50 costumes were created for free for families with youth in wheelchairs. “This year, I want to do 100, and the board thinks I’m crazy, but that’s what they’ve said every year,” said Ryan. A single costume can take anywhere between 200 and 400 hours to build and cost around $1,500. As the idea caught fire, Ryan and others quickly realized that Halloween wasn’t the only time of year kids could go out and make their mark on the people they met. Comic book and pop culture conventions, where many attendants dress up as their favorite characters, were a perfect place for Magic Wheelchair. In 2016, the group made one of their most important connections to date – Cassie Husdon. Cassie is a fan of the show Arrow, featuring the character Green Arrow, and wanted something that would fit in with the look of the production. The builders assembled a trike costume that almost completely disguises Cassie’s wheelchair and included exhaust pipes and a working motor that rumbled the costume so she could get a feel for what it would be like in real life. They presented it to her at Rose City Comic Con in 2016. Ryan didn’t realize just how much the gift meant until he invited Cassie to be part of a panel at another convention later on. Cassie and her mother now build her own costumes. Magic Wheelchair has gone on to become a highlight of some of the biggest pop culture conventions in the world. Last year, the teams produced an entire set of Justice League costumes for San Diego Comic Con and, this year, a Star Wars-themed set of builds is already in the works. Last week, the organization won an online voting contest that will result in a 3D printer from Re:3D. Ryan hopes it will lead to building kits that can be shipped anywhere to kids in wheelchairs. “The cold reality is that some of the kids won’t be around as long as others and we want to cram as much epicness as we can into the time we have with them,” said Ryan, who is also a full-time nurse. While it’s easy to get swept up in all the hoopla Magic Wheelchair inspires, this story is still very much about Ryan and his family. Bryce’s favorite costume so far is a mining ship from the movie Guardians of the Galaxy. For Keaton, it’s a tie between Toothless and a later creation known as Indominus Rex. Keaton also designed the character Ryan is working on for next Halloween. Asked what he wanted other people to know about Magic Wheelchair, Keaton doesn’t miss a beat.